With the opening of a new gallery and the return to Portland of the Bakery Photo Collective, Forest Avenue is emerging as a mini-arts district. By any measure, Forest Avenue is an ugly road. It’s congested with automobiles and scarred by generations of unfortunate architectural decisions that have left it without a clear sense of its own history or, until recently, its potential. And that’s being kind. They are. Artists are leading a Forest Avenue renaissance with a new contemporary art gallery, the return to Portland of a longstanding photography co-op and the emergence of a black box theater that is being used nearly 200 nights a year by actors and dancers. There are new restaurants, and crews will begin this summer road on a major reconstruction project that’s designed to improve traffic flow and make Woodfords Corner more appealing and safer for pedestrians and cyclists. There’s public art coming in the form of other-wordly streetlights by Portland artist Aaron T Stephan, and a new neighborhood group is organizing a series of talks to highlight the history and character of one of Portland’s most maligned neighborhoods, whose central architectural feature is the landmark Odd Fellows Hall and its 100-foot clock tower that watches over the intersection. 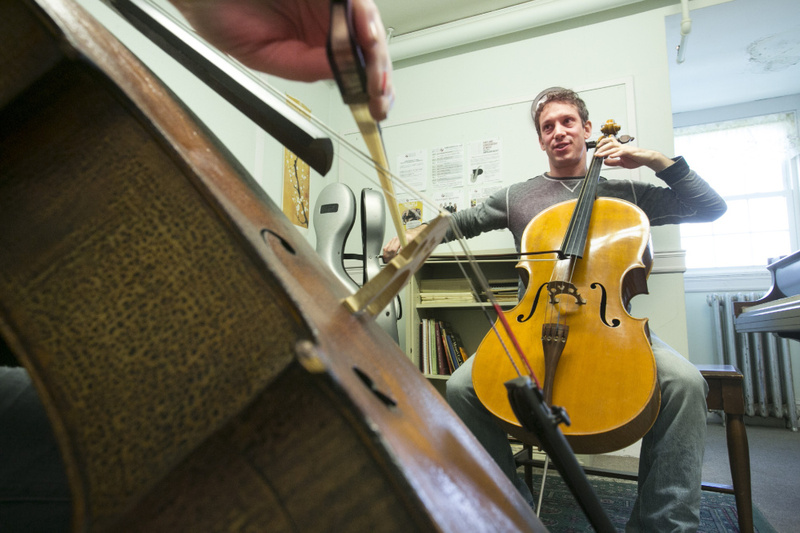 Instructor Ben Noyes works with Jennifer Hallett during a cello lesson at the Portland Conservatory of Music at Woodfords Congregational Church in Portland. The group’s vision for the neighborhood, located just two miles from downtown Portland, includes galleries, restaurants, cafes and ethnic markets. Much of that is already in place, and more is coming. Art is central to the goal, because exhibitions and performances bring people out and help create a sense of community, Valliere said. A new contemporary art gallery, Speedwell Projects, opened in February at 630 Forest Ave. in a century-old building that once housed an early auto showroom. It has elegant, wrap-around windows that caught the eye of artist Jocelyn Lee when she and her husband looked at the building last year. They loved the building so much they bought it, giving Lee, a photographer, the push she needed to open a gallery and show the work of artists she loves and wants to promote. This spring, the Bakery Photographic Collective will open in the back of Speedwell Projects, returning to Portland after most of a decade in Westbrook. Lee, a member of the collective from its early days in Portland, lured the co-op back to Portland, and off the peninsula, with the promise of affordable rent, gallery space for exhibitions and room for workshops and community events. The Speedwell Projects space on Forest Avenue opened in February. Lee taught photography at Maine College of Art in the 1990s and left for New York in 2001, where she lived in Brooklyn and commuted to a teaching position at Princeton University in New Jersey. She returned to Maine three years ago with the hope of opening a gallery showcasing contemporary artists from Maine, New York and across the country. In its most recent business incarnation before Lee took it over, the space was known as Dollar Kings, a tobacco outlet that advertised its business with an obtuse yellow sign that diverted attention from the wrap-around windows and robbed the building of its architectural accents and character. Inside, when Lee peeled back the false walls she unearthed artfully made moldings and other handmade details from the early 1900s, when the building was built. Neighbors today are a stained-glass studio, a Halal market and a chain pharmacy. There’s a new Somali restaurant, Mini Mogadishu, just up the block. Big Sky Bakery is a short walk away, as is the arts store, Artist & Craftsman Supply. 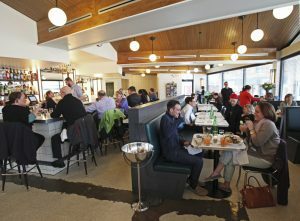 Woodford Food & Beverage opened a year ago, offering upscale American fare in a modern setting. A Company of Girls, where young women come together to learn theater and the arts, relocated to Woodfords Corner, as did the youth theater company STAGES, operating at Woodfords Congregational Church. 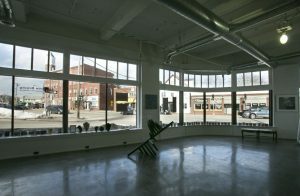 Forest Avenue’s emergence as an a mini-arts district began in 2013 when Portland Ballet opened a 73-seat performance space adjacent to its dance studios at 517 Forest Ave. The Studio Theater is home to Portland Ballet company dancers, and theater groups rent it to alleviate Portland’s tight theater market. Between Portland Ballet and 20 theater groups, the theater will be used 189 days during the current performance season, which runs fall to spring. It’s already booked for 110 days for the 2017-18 performance season, said Michael Greer, Portland Ballet’s executive director. A half-mile up the road, the Portland Conservatory of Music presents about 75 concerts a year at Woodfords Congregational Church, creating bookends of music, theater and dance with Portland Ballet. The Bakery Photographic Collective hopes to tap into that energy. 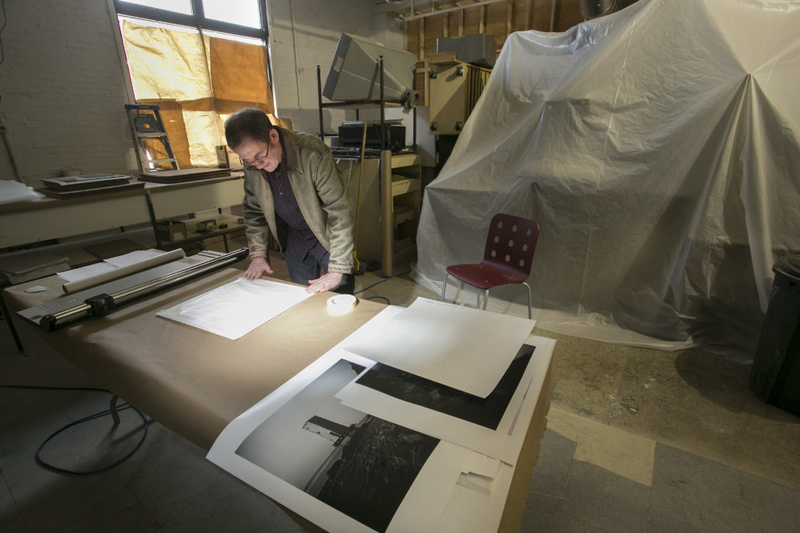 The co-op is an artist-run member organization that provides photo labs for a dozen or so fine-art and commercial photographers. Moving back to Portland means it also will do more public programming, said longtime member Tonee Harbert. The group began in what is now the Bakery Studios on Pleasant Street in Portland in 2000. It moved to the Dana Warp Mill in Westbrook in 2009 to spacious studios that overlooked the Presumpscot River. With its lease up in Westbrook, the co-op decided to move back to Portland. Membership was waning, and the co-op wanted a more public presence. 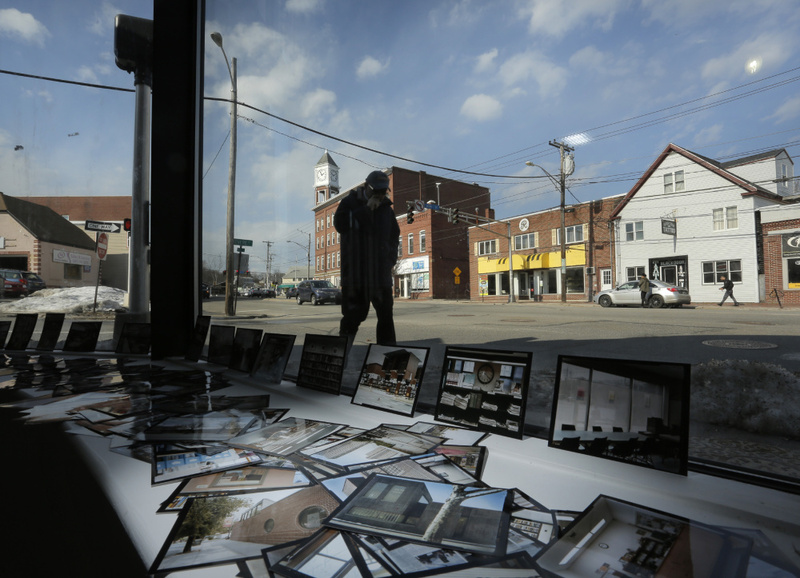 In Portland, in addition to making its film and digital labs available to members and guests through temporary memberships, the Bakery will host classes for beginner and experienced photographers, portfolio reviews, artist talks and exhibitions. Harbert hopes the move boosts membership, as well. Tonee Harbert wraps prints in the new home of the Bakery Photographic Collective on Forest Avenue. Harbert is excited about the collective’s move back to Portland, where it started on Pleasant Street in 2000. The group moved to studios in the Dana Warp Mill in Westbrook in 2009, but with membership waning and desirous of a more public presence, decided a fresh start in Portland was in order. The Bakery could have presented more public programming in Westbrook, but it makes more sense to start fresh in Portland, said Bakery member Smith Galtney of Raymond. The Bakery is in the process of registering with the state as nonprofit, enabling it to apply for grants and raise money. Co-op members are renovating the space and hope to have it open this month or in early April. The dining room and bar at Woodford Food & Beverage, which opened a year ago offering upscale American fare in a modern setting and is another business contributing to the cultural growth of the Woodfords Corner neighborhood. The Bakery ties into Maine’s legacy as a training ground for photographers and a place where contemporary photographers enjoy working. Portland’s photo scene is particularly active right now, with galleries and museums dedicated to the art form. Harbert is confident the Bakery will be better positioned to support and encourage photography, and to benefit from an exchange of ideas with a wider community. “We just want to be a real photographic resource to southern Maine in as many ways possible,” Harbert said. The name “Speedwell” references the pinnace that sailed in tandem with the Mayflower, although it turned back after taking on water. Lee chose the name because she likes the nautical reference and the good fortune it suggests. For all the recent progress to improve the livability of the neighborhood, the upcoming construction season will challenge Woodfords Corner with a major transportation project that will alter traffic flow and, planners hope, change the way pedestrians interact with businesses. Somewhere between 10,000 and 24,000 cars pass through the neighborhood daily, according to transportation officials. Valliere, the administrator of the neighborhood group, is focusing on what she hopes will be the project’s positive outcome. The inconvenience of construction, she said, will be worth it. In bringing people together, the Friends of Woodfords Corner have brought attention to the neighborhood and some of its charms. Last year, the group worked with Greater Portland Landmarks to present a program about the history of the neighborhood. More than 200 people showed up. When the city hosted forums with Stephan to talk about his public art, another 100 turned out, and many spoke up. Observing those meetings, Valliere appreciated the passions of her neighbors, and felt thankful to be part of a community movement. Up the street at the Portland Conservatory of Music, Murachanian has noticed the neighborhood change in the 18 months she’s been with the music school. The conservatory has been through ups and downs at its Woodfords Corner location, and there’s an ongoing conversation about whether the Woodfords is the best place for the music school. Lee moved back to Portland from Brooklyn, and she chose Forest Avenue as the location for her gallery because it reminded her of her favorite borough.